Starting from Camprodon, head for Santa Pau, the first stop. This town was declared Historic-Artistic Complex in 1971, which permits to preserved its history. For example, the main square was reproduced in Poble Espanyol, in Barcelona, to represent the Catalan architectural heritage, for the International Exhibition. The main square is then a highlight of the city, especially with the portal of the Vila Nova. You can also visit the Castle of Santa Pau, built between the thirteenth and twentieth centuries, in different stages. Finally, the portal de Vila Vella, where, on clear days, you can see an amazing view on the Bay of Roses. Mieres, the entrance to the Volcano Natural Park. It combines four different villages, though it has preserved the character and identity of a village. The panoramic view is breathtaking, seeing La Garrotxa and even to Costa Brava. It used to be a hideaway for bandits, which give a real history to it. You can visit three different churches, two Baroques and one Renaissance, added to the typical village architecture. It is also a great spot for hiking, offering charcoal makers route. 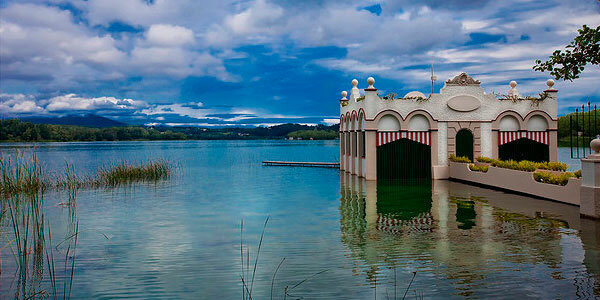 Next stop, Banyoles, with its famous lake, place for the rowing event during the Barcelona Olympic Games (1992). A fresh break during a hot summer. You can enjoy a swim or water activities like rowing and canoeing. After this break, enjoy the Medieval heritage of the city, particularly with the Plaça Major, also registered as a Cultural Property of National Interest, with its forty surrounded arches. Between the thirteenth and the fifteenth century, the city started to protect itself thanks to a wall. It was pretty damaged during the Catalan Civil War, but thanks to a restoration work, you can still see now a fragment of the wall, to understand how it was made. The town also knew how to exploit the booming textile sector, during the fifteenth century, by dyeing wool to export through the Mediterranean sea. You can now visit the dyeing market. There is also a religious heritage, the Iglesia de Santa Maria dels Tures, a gothic church and Monasterio de Sant Esteve, first Benedictine monastic settlement of Catalonia. Still have time for one more village? Head for Tortellà on the way back to hotel Grevol, the gateway to the Alta Garrotxa. 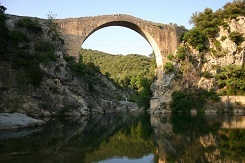 Two main medieval points of interest, first, Santa Maria church, built on the basis of a romanesque church and the Llierca bridge, an impressive single-arched romanesque bridge (Cf. picture on top). If you are looking for other Medieval heritage in La Garrotxa, you can check here or see our front desk where we will be happy to give you information. Enjoy your visit of La Garrotxa!